We received a letter from a customer. I thought I'd drop you a line to let you know about a new use for something you sell. You know that Air Buddy I bought from you a few months ago? I had an inspiration and tried it for something else. I'm involved in rescue with helicopters. I use a Storm whistle to signal the choppers. Sometimes, during a rescue or training practice I'm a bit winded and have trouble trying to blast a proper air signal through a whistle. For example, a signal to get the attention of a ship is a long blast of the whistle. A signal to tell the ship that there is some kind of emergency is four short blasts, repeated. And of course, if you must signal to someone who is dense, you can use the universal dit dit dit dah dah dah dit dit dit signifying S.O.S. And we have our own special signals with the chopper that I can't tell you about. The point is, try blowing a whistle with those signals while you're trying to swim against a current to hold your position near a craft and having waves breaking over your head. You'll pop a lung trying to get enough breath. So I put my Air Buddy up against the whistle, like they were kissing, and squeezed the Air Buddy with my fingers. You wouldn't believe the blast that thing put out. 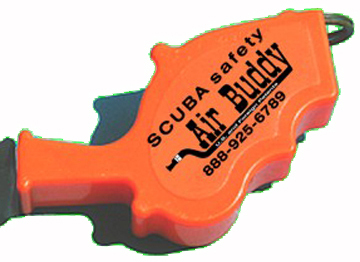 You should suggest to your other customers who have the Air Buddy to get a Storm whistle. I've never heard such a loud scuba whistle. The chopper heard us with no problem at all. In case you want to use this letter on your website, please don't put my name or where I work. I am not sure that I am allowed to write a testimonial letter in my official capacity. Best regards,...."
NOTE: The Air Buddy is the smallest and safest alternate air source now available. The result of that letter. Notice: Although the original Air Buddy, the AB-911 will blow the whistle, it is not the one that makes this super blast. The high performance Air Buddy, the AB-2000 is the one that must be used to make this really work. Therefore, when we talk about this promotion, we are talking about the AB-2000. 1. Notice that the Air Buddy in the picture is the AB-2000 because it has the gold ring. While the AB-911 can blow the whistle, only the AB-2000 has the extra power needed to make this the loudest whistle combination in the world. 3. To blow the whistle, simply put the Air Buddy and the whistle together in a "kiss" position and squeeze the Air Buddy mouthpiece with your fingers. Be careful not to point it at your ears. It can be heard by a boat up to a half mile away. We are going to post a lot of information about the Storm Whistle toward the bottom of this page, so you can see what it is all about. You can have your Air Buddy on an octopus hose, on a quick connect to snap onto your BCD power inflator or with a safety valve to mount directly onto a regulator 1st stage to assemble your own pony bottle. For over 10 years police and security personnel have depended on the unique power and consistency of the Storm whistles. Crowd control, traffic direction and emergency signaling are all made easier with these incredibly penetrating whistles. The Storm whistles are tuned to 3250 hertz which enable these whistles to penetrate through glass, into the most soundproof car, sound over the roar of a unruly crowd and be heard over the clamor of crowds and scream louder then machinery. Security detachments, Peace keeping and police have all benefited from the Storm whistle's power to produce a loud clear alarm, produce it easily, and produce that alarm in any conditions. CURRENT USERS OF THE STORM WHISTLES. Developed for military use, this whistle outperforms all other whistles with a decibel power rating of 94.7, while focusing nearly 100% of harmonic energy at the optimum 3125 Hz range of other high powered whistles. EXTREMELY LOUD- KEEP OUT OF THE REACH OF CHILDREN. Comment from West Marine Corp. The unique design of the Storm Safety Whistle makes it the loudest whistle you can buy, even if it's been drenched with water. Special self-draining chambers quickly purge water, to create a sound level many times louder than U.S. Military whistles. You can even hear it underwater! Plastic construction with easy-to-grip ridges. The Storm All-Weather Safety Whistle from Markwort Sporting Goods Company is the loudest whistle on the market. It's unique patented design allows it to be heard under water, up to 50 feet, because the sounding chamber forces all water to be purged when the whistle is blown. Made in the USA. It's perfect for divers, lifeguards, and for recreation! Creates a clear, high frequency sound, with a power rating over 75% greater than other referee and safety whistles. With a standard whistle, nonproductive high frequency (over 5000 hertz) and nonproductive low frequency (below 2000 hertz) sounds are created. Because of the patented harmonic chamber that is unique to the Storm whistle, these high and low frequency sounds are recycled and focused into our extremely loud single 3150 hertz frequency of double the standard amplitude. The focused 3150 hertz frequency was generated intentionally in accordance with government recommendations that showed that the 3150 hertz tone is the most readily heard over the noise of motors, crowds, and explosions.